In Alameda County, CA, eight community-based organizations have banded together to help undocumented immigrants fight for their rights. Malena Mayorga, the Rapid Response Coordinator for ACILEP, talks to FFI volunteer Cindy Knoebel about how ACILEP was formed and the services it provides. Cindy Knoebel: What was the impetus behind the launch of ACILEP in February 2017? Malena Mayorga: The presidential election of 2016, and its implications for immigrant rights, has inspired many communities to launch rapid response networks. We want to organize and act from a position of power, not fear, by having the training and network that enable us to protect each other. ACILEP is a partnership among eight community-based organizations and two legal ones: Black Alliance for Just Immigration, Causa Justa/Just Cause, Centro Legal de la Raza, Filipino Advocates for Justice, Interfaith Movement for Human Integrity, Mujeres Unidas y Activas, Oakland Community Organizations, Street Level Health, Arab Resource and Organizing Center and the Alameda County Public Defender’s Office. CK: What services does ACILEP provide? MM: ACILEP has three components: one is our rapid response network, consisting of our hotline, legal observers and dispatchers. We respond to calls of ICE enforcement actions by verifying and documenting the incidents. I coordinate this component, based out of Mujeres Unidas y Activas. The second consists of providing legal services for those in detention and deportation proceedings, coordinated by Centro Legal de la Raza. The third is community education, through Know Your Rights Workshops, with the intention of preventing detentions and deportations by ensuring people know their rights and are prepared to exercise them if ICE knocks on their door or stops them on the street. This component is coordinated by Causa Justa /Just Cause. CK: ACILEP’s model is particularly impressive because at its core is access to legal support, which many communities find difficult to provide. MM: Yes, we are very grateful for our two legal partners: Centro Legal de la Raza (a legal services agency providing services to low income and immigrant communities), who is also our fiscal sponsor, and the Alameda County Public Defender’s Office. The funding for our work comes primarily from the San Francisco Foundation and Alameda County, with a portion provided from the City of Oakland. CK: As ACILEP’s Rapid Response Coordinator, tell us about your hotline. MM: The ACILEP hotline is staffed 24/7 by dispatchers who are also community educators working at our partner organizations. We’ve also trained a few hundred volunteers as responders and legal observers to verify and document ICE enforcement actions and connecting impacted people with support. The number of calls varies greatly depending on what is happening both in the community as well as in the media. We get calls on ICE enforcement activities, as well as a lot of false alarms. People sometimes confuse other law enforcement activity with those of ICE. There is a lot of fear right now. Part of our work is to verify what is or is not actually occurring in order to both expose ICE raids and dispel false rumors that only spread fear. We also receive many cases of people who are already in immigration detention. Because of Alameda County Sheriff Ahern’s collaboration with ICE, many of the cases of detention we hear about on the hotline are results of the Sheriff handing someone over to ICE as soon as they are released from a county jail. Many other callers have questions about immigration in general or about specific cases, which we refer to the legal team at Centro Legal de la Raza. Unfortunately, we’ve gotten abusive calls as well. The community has expressed great gratitude knowing that this network exists. CK: How are you spreading the word about ACILEP? MM: Each of ACILEP’s three components helps to build awareness about the network. In particular, we reach many people throughout the county through our Know Your Rights workshops, which we also use to let people know about the hotline and services. We also do street outreach in immigrant communities and at activities and events, handing out fliers and Know Your Rights cards with the hotline number. Additionally, each of our partners does their own outreach to their base. CK: What has ACILEP learned from operating a rapid response program since launching? MM: Our experience with ACILEP has reinforced our understanding of the devastation the current immigration system inflicts, in particular on working class immigrants of color: the trauma, the family separation and community tears, the criminalization of refugees, the violation of basic human rights, the racial profiling, the abusive conditions in detention centers, the lack of due process, the incentive for mass detentions in a for-profit system, the state violence… It’s heartbreaking and completely unjust. Our clarity of the importance of true sanctuary policies is also backed by what we hear every day. Local law enforcement collaboration with ICE is extremely harmful. There is already a lack of confidence in police, rampant racial profiling and a lack of due process. In fact, we’ve heard numerous people say they won’t call the police because they are afraid they will collaborate with ICE or that they will not be treated fairly due to their perceived immigration status. It is necessary not only that local governments have policies clearly stating that they will not cooperate with ICE in any way whatsoever and that they will stand up to protect immigrant communities, but also that they actually abide by them. Additionally, we’ve experienced first-hand how important collaboration is. We are a partnership of eight organizations and two legal service offices, which includes organizations that work in Black, Asian Pacific Islander and Latinx communities. We collaborate with allies in other communities around the Bay area to reach a wide diversity of immigrants. 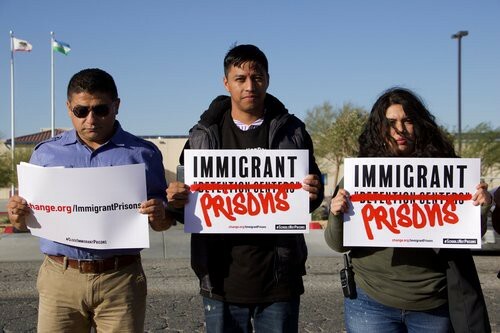 Moreover, we are clear that our work is about racial and economic justice, and that we need to collaborate with organizations carrying out other pieces of the work of the immigrant rights movement. At the regional level, we collaborate with the Northern California Rapid Response and Immigrant Defense Network, which was created to facilitate coordination among the local county networks and fill the gaps where there are no local networks in Northern California. We participate in regional committees, collaborate on multiple efforts and share what we have learned from our experiences building our network and training dispatchers and responders. Above all, our experience has affirmed the importance of organizing locally to protect each other and the power of collective strategic action. We will continue to deepen and expand our network in defense of immigrant communities. Our commitment is stronger than ever.